In the 1970s, Vineyard conservationist Henry Beetle Hough, editor and publisher of this paper from 1920 to 1965 and founder with his wife Betty of the Sheriff’s Meadow Foundation, suffered the greatest conservation defeat of his life. 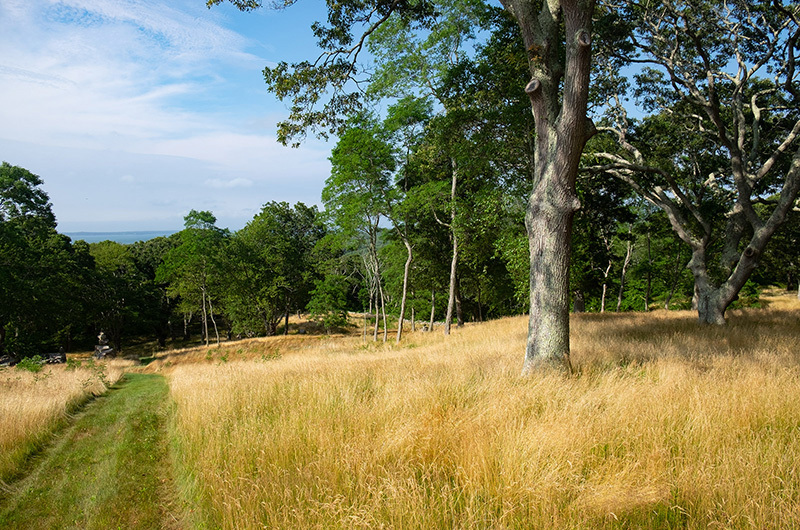 That was when the Nantucket Sound Islands Trust Bill that would have protected the Vineyard from overdevelopment failed to be endorsed by the U.S. House of Representatives subcommittee on national parks and recreation. In that same decade, however, Mr. Hough enjoyed what he considered his greatest conservation victory next to the creation of Sheriff’s Meadow. It was saving Mohu, the 218-acre north shore estate of woods and hills, shoreline and rolling meadows, from being sold to a Falmouth developer. Mr. Hough knew Washington Post publisher Katharine Graham had been renting an Edgartown house on Eel Pond for some summers and he learned that she had thought of buying property on the Vineyard. He wrote to her about Mohu and had pictures sent to her. She became interested enough to be willing to buy a part of it. That was not enough for Mr. Hough. He and his brother George had summered since childhood at neighboring Indian Hill and had crossed Mohu’s extensive hills and meadows countless times as children. Mohu was land he loved. He was determined that it would not become house lots. “To let that splendid piece of the Vineyard go forever to blacktop roads and chopped up half-acre lots with pre-fab and rock-type dwellings would be tragic,” he said later. Mr. Hough also approached Fairleigh Dickinson Jr., a longtime seasonal resident of Edgartown and philanthropist, about possibly buying the property. Meanwhile, Mohu owner Libby MacFarlane began to think twice too and approached the Vineyard Open Land Foundation, which did limited developments at the time, about some kind of sale. Then at one point Mr. Hough learned that Mrs. Graham was back on the Island. He took her to see Mohu again. Every morning he would leave his desk at the Gazette office, to show her another part of the property. He would tell her stories of the sailing schooners he had seen pass by Mohu when he was a boy. At lunchtime, he would return to the Gazette office to report on how the morning had gone. Finally, Mrs. Graham gave in. She bought Mohu in July of 1972. Ecstatic, Mr. Hough wrote to Mr. Dickinson to thank him for the role he had played. “We have a wonderful property saved, and together with it an important gain for the Vineyard which so badly needs gains of this kind,” he wrote. Today with 186 acres at Mohu for sale, the Vineyard needs another important gain. Mr. Hough is gone, but there are many well-to-do individuals who are Vineyard lovers as well as local and state conservation organizations who could seek once more to preserve the integrity of Mohu’s gracious, spacious lands.